I hope everyone had a wonderful weekend. I have to say, having your birthday fall right before a long weekend definitely has its advantages. :) As part of my gift the girls gave me coupons. One of them was for shopping without complaining. I had no problem taking them up on that one. I have been wanting a table for our living room for quite some time. I finally got a chance to look for one on Saturday. We didn't find exactly what we wanted but it did help me get an idea of what I was looking for. We came home and did some more searching. I found this gorgeous piece. I have a project to share for you today. I created this card and gift box for a Bo Bunny product spotlight over at Emma's Paperie last week. You can find all the supplies along with the other designers projects here. It promises to be another beautiful day here in Indiana. Off for my morning walk with my sweet friend Amanda and then I hope to get some scrappin' done. Hope your day is sunny and perfect. Take care everyone! Hi Lisa!! I think furniture shopping is one of my favorite things to do. If I were rich, I'd restyle my house every season! Love that piece you chose. Hope you can find it, or something close. Love the card, too. Those colors are some of my favs! Great cards! And Happy Birthday! That is a beautiful table Lisa! Good luck with the search! Love your card and box - lovely as always! Happy Birthday, I do think that having a birthday over the weekend is the best for lots of celebrations! Happy Birthday! 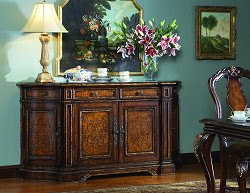 And I love the furniture you are looking at - - hope you find it close to home! Your cards are really fabulous! Hey there, Lisa! Happy Belated Birthday, my friend! How cool that you and my son, Pete have the same b-day! Hope you had a wonderful one. That table looks fabulous. Right up my alley. Hope you get a chance to see the real deal. I'd be scared to purchase it sight unseen, too. Love your BoBunny set. That round box is so sweet and I adore the matching round element on the card. Adorable colors, too. oooh those pieces are awesome! just gorgeous. i wish i could shop for that everyday!